Apparently, this is part of a new Iranian “Just say no … to Talmud” campaign. This is an actual official Iranian News Release – I can’t make this kind of stuff up. TEHRAN (FNA)- Iranian First Vice-President Mohammad Reza Rahimi condemned Zionists for inciting global drug trade and addiction in a bid to annihilate non-Jewish communities in accordance with Talmudic teachings. 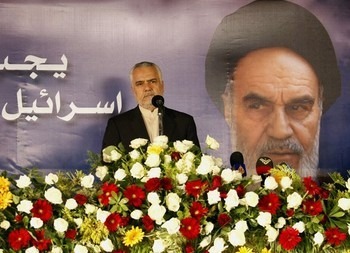 Addressing a ceremony on the occasion of the International Day of Drug Abuse here in Tehran on Tuesday, Rahimi stated that prevalence of narcotics and drug-addition throughout the world finds its roots in the wrong teachings of the Zionists’ religious book, Talmud. The Talmud (Hebrew: "instruction, learning") is a central text of mainstream Judaism in the form of a record of rabbinic discussions pertaining to Jewish law, ethics, philosophy, customs and history. "The book teaches them how to destroy non-Jews so as to protect an embryo in the womb of a Jewish mother," Rahimi stated. So the next time you hear an article about poppy growers in Pakistan and Afghanistan, or marijuana growers in Mendocino county, or meth labs in Alaska, or the Columbian drug cartel – just think about how much Talmud they must be studying. TEHRAN — Iran’s vice president delivered a baldly anti-Semitic speech on Tuesday at an international antidrug conference here, saying that the Talmud, a central text of Judaism, was responsible for the spread of illegal drugs around the world. European diplomats in attendance expressed shock. Even Iranian participants in the conference, co-sponsored by Iran and the United Nations, privately wondered at their government’s motive for allowing such a speech, even given its longstanding antagonism toward Israel. More than 25,000 Jews live in Iran, and they are recognized as a religious minority, with a representative in Parliament. The speech by Vice President Mohammad-Reza Rahimi seemed bound to isolate Iran further just days before a new set of onerous Western economic sanctions, notably a European embargo on Iranian oil, is set to be enforced because of the longstanding dispute over Iran’s nuclear program. Iran says the program is peaceful, and Western nations and Israel suspect it is a cover to develop the ability to make nuclear weapons. The “Zionists” are in firm control of the illegal drug trade, Mr. Rahimi said, asking foreign dignitaries to research his claims. “Zionists” is Iran’s ideological term for Jews who support the state of Israel. What made his remarks even more striking is that Iran’s fight against illegal drugs is one of the few issues on which the Islamic republic can count on Western sympathy. Iran’s battle to stop the flow of drugs coming in from neighboring Afghanistan has often been mentioned as a potential field of cooperation during negotiations over the country’s nuclear program. Mr. Rahimi, who spoke after Mr. De Leo, told stories of gynecologists’ killing black babies on the orders of the Zionists and claimed that the Bolshevik Revolution in 1917 was started by Jews, adding that mysteriously, no Jews died in that uprising. But the diplomat, who declined to be identified by name or country, defended his presence at the conference. “If we do not support the United Nations on helping Iran fight drugs, voices like the one of Mr. Rahimi will be the only ones out there,” he said. ← New anthology with Craig Smith’s translation?